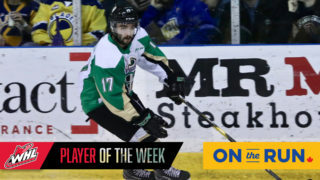 Prince Albert, SK – Brett Leason can check off another milestone in his incredible start to the season. 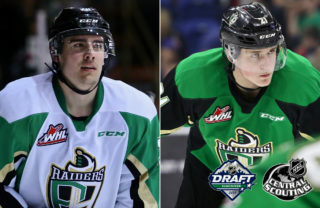 On Tuesday, the Calgary product tallied his first career WHL hat trick to lead the Prince Albert Raiders (21-1-0-0) to a 5-1 win over the Lethbridge Hurricanes (9-8-2-2) at the Art Hauser Centre. That upped Leason’s goal count to 22 on the season. Brayden Pachal had a goal and two assists in the win. Parker Kelly chipped in with three assists. Leason opened the scoring 4:30 into the contest. Kelly streaked down the right win and found an open Leason in the slot, who snapped a shot through Hurricanes goaltender Reece Klassen for the only goal of the opening 20 minutes. In the second, the Hurricanes tied the game 28 seconds into the frame. Taylor Ross’ initial shot was stopped by Ian Scott. He collected the rebound, threw it off the post, off of Scott’s skate, and into the net to make it 1-1. That score held until late in the frame. With 1:05 to play in the period, Brayden Pachal’s shot from the point got through traffic, deflecting off of a Hurricanes defenceman in front and past Klassen to restore the Raiders’ lead at 2-1. The Raiders took over in the third period, boosted by the momentum from an early power play. While they gained momentum with the man advantage, they extended the lead shorthanded. 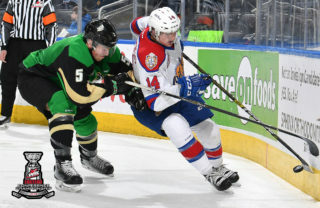 Leason entered the zone on a partial two-on-none with Sean Montgomery, who was playing in his 300th game, and wired a shot through Klassen at the 7:03 mark. Four minutes later, Leason completed the hat trick. Pachal forced a turnover at the blueline to Kelly, who fed Leason in the slot. 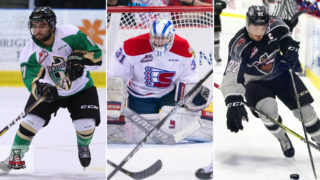 The Calgary product beat Klassen five-hole to make it a 4-1 game. Kody McDonald rounded out the scoring with the Raiders’ second shorthanded goal of the game. Parker Kelly made a beautiful cross-ice pass to the overager, who roofed it over Klassen with 3:00 to play. Ross’ goal was the lone blemish on the night for Scott, who stopped 29 shots in the win. Klassen made 33 saves in the loss. 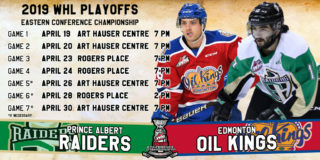 Up next for the Raiders is a trip to Medicine Hat to take on the Tigers (10-11-1-2) at the Canalta Centre on Friday night as they open a stretch of seven games away from the Art Hauser Centre. Game time is 8:30 p.m. CST. 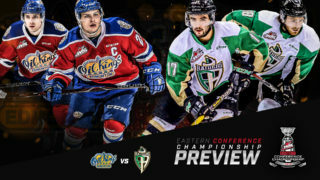 The next Raiders’ home game is on Saturday, December 8 against the Brandon Wheat Kings (10-5-3-3).Tickets are available at the Raider Office and at raiderhockey.com. Game time is 7 p.m.